The current economic system has ‘wealth extraction’ masquerading as ‘wealth creation’ to the long-term detriment of everybody, even the super rich. New thinking is needed. 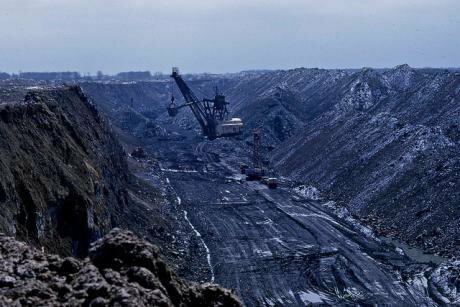 Coal shovels at work in Randolph County, Illinois c. 1970. Katy McClelland/Flickr. (CC 2.0 by-nc-nd)You know something is grotesquely wrong when the 80 richest people in the world have as much wealth as the poorer half of the world’s population, when the combined wealth of the 1000 richest people in the UK is nearly five times the size of the annual NHS budget, and when unending growth is assumed to be possible in a finite, rapidly overheating planet. But conventional approaches to economic matters can’t explain what is wrong. Relations between people, whether as buyers and sellers, employers and employees, lenders and borrowers, landlords and tenants, citizens and governments, or as providers and beneficiaries of unpaid work. Our relations to the environment, as all material wealth ultimately depends on this. Looking after the environment should make economic sense, degrading it does not. No one ever got rich or poor outside these two sets of relations. ‘Moral economy’—unlike mainstream economics—focuses on these and examines whether they are fair or unfair, functional for provisioning or not, and sustainable or unsustainable. Particularly at this time of economic and environmental crisis, it can provide us with signposts to a different way of doing things. Mainstream economics misunderstands people. ‘Homo oeconomicus’ is assumed to be a free-standing, adult man, self-interested and entering only into contractual relations with others where he wishes. But a society comprised wholly of such individuals is an impossibility. We are social beings. That means not merely that we happen to live in groups, but that we are inherently dependent on others. Entering into social relations is not only necessary but unavoidable. Most fundamentally this is because we all start off as helpless babies, utterly dependent on our carers. This is a universal. And particularly in old age or illness we again become dependent on others. Dependency can be good (having good parents), or it can be bad, a source of exploitation. It’s important to know the difference, but mainstream economic thought ignores the first and largely conceals the second. First, you can produce some goods or services that others want and for which they are able to pay (something-for-something). Second, if you’re not able to produce goods or services or provide for yourself—because you’re too young, old or infirm to work, or because there are not enough jobs to go around—others may agree to meet your needs, whether privately or through democratically agreed transfers via the state. Third, you can get money from others by controlling existing assets like property or money that they need but lack, and can therefore be forced into paying for them. If the assets already exist and have been paid off, then the income is unearned (something-for-nothing). And since the money the owners get only has any value if there are goods and services they can buy with it, then those who produce them must be producing more than they themselves can buy with their pay in order to support this free riding. As I show in my book Why We Can’t Afford the Rich, the astonishing rise in the wealth of the rich in recent decades is mainly the result of the growth of the third source of income—‘asset-based unearned income’. A prime example of the something-for-nothing economy is windfalls going to property owners from inflation in property prices. The neoliberal economic ideology of the last three decades expands this third source of income at the expense of the other two, squeezing wages and salaries of the majority of the population while shrinking the transfers organised by the welfare state. It is a system that has promoted wealth extraction under the guise of wealth creation, producing poverty on one side and extreme wealth on the other. The difference between wealth creation and wealth extraction can be concealed by playing fast and loose with the word ‘investment’. Investment surely sounds laudable, but it can mean two very different things. Sometimes it refers to funding and providing new sources of goods and services, like infrastructure, new technologies, or training people. Here the focus is on objective benefits—wealth creation. But it’s also used to refer to things that need have no connection to this, such as getting interest on savings, or capital gains from the rise in value of existing property or financial products. Here the focus is on financial gains to the ‘investor’—wealth extraction. Of course, an investor could be funding objective investments in the first sense, though as long as they get a good return they tend not to care. In a neoliberal economy where delivering ‘shareholder value’ is the prime goal of companies, unearned income based on control of existing assets is the chief source of ‘investment income’. The stock market exemplifies this. At any moment, only a miniscule proportion of share transactions are for newly issued shares; the rest are second hand. So if you buy, say, some M&S shares, the money goes not to the company but to the previous owner of the shares. But having bought them you’ll normally get a stream of unearned income from the company in the form of dividends, and you may be able to get more by selling the shares on at a higher price. And share prices have tended to rise overall, as the growth of pension funds and other big investors wanting to buy shares has not been matched by a growth in the availability of shares. So it’s only an investment in the second, extractive sense; you haven’t created any new wealth. Obviously, an excess of wealth extraction over wealth creation is ultimately unsustainable—hence the crash of 2008 and its aftermath. So this something-for-nothing economy is not only unjust in allowing free riding on the labour of others, but it is dysfunctional for the economy. An alternative economy that is both feasible and fair must be one that blocks or taxes away asset-based unearned income, and restores transfers and objective, wealth-creating investment. But it also needs to be sustainable in environmental terms. Our relations to the environment should be central to economics, not left to a marginal, low-status sub-discipline called ‘environmental economics’. On a finite planet, never-ending growth is an absurdity, and yet the vast debts that the financial sector has created through over-lending can only be repaid through such growth. Even if that were attainable it would be utterly unsustainable environmentally. The amount of carbon dioxide released in making and using particular items may be falling, but nowhere near fast enough to offset overall growth in consumption and population. Forty-five percent of global emissions are attributable to the richest ten percent of the world’s population. Rich consumers and producers emit far more emissions than their share of what the earth can sustainably absorb, trashing the environment of the majority who live sustainably, as well as their own. If we are to stop runaway global warming they will have to cut their consumption, otherwise it will be too late by the time renewable energy resources displace fossil fuels. Doing so need not lower their quality of life. Plenty of research on well-being and happiness has shown that beyond a moderate level, increases in income do not improve our lives; good relationships with others and fulfilling work are more important. Yet few among the top ten percent will cut their consumption voluntarily, so the 90 percent need to push for policies that reduce their income. Our democracies are increasingly operating in the shadow of a global plutocracy of the super-rich and major companies, which finance and lobby political parties to do their bidding. Where fossil energy companies are concerned, that means business as usual. So too for a financial sector which, even after being bailed out by the public, has retained its power to extract and hide its vast flows of unearned income. Now is the time to confront those powerful interests. As the Pope’s encyclical made clear, saving the planet depends on achieving greater social justice. Our relations to each other and to the environment are thoroughly intertwined. We will only find solutions to the climate crisis if we have climate justice. This is why we need to rethink economics in terms or relations between people, and between people and the environment. That means moral economy.